Another favorite saying about garlic is “Eat garlic and gain your health, but lose your friends.” Fortunately, there are now commercial preparations that provide all of the health benefits of garlic without the social consequences. Do “odor controlled” or “odorless” garlic products contain allicin? Some do and some do not. Since allicin is the component in garlic that is responsible for its easily identifiable odor, some manufacturers have developed highly sophisticated methods in an effort to provide the full benefits of garlic – they provide “odorless” garlic products concentrated for alliin because alliin is relatively “odorless” until it is converted to allicin in the body. Products concentrated for alliin and other sulfur components provide all of the benefits of fresh garlic if they are manufactured properly, but are more “socially acceptable.” Because alliin and alliinase are very stable when garlic is properly processed, there is a method to ensure that the allicin is not produced until the garlic powder mixes with the fluids of the intestinal tract. This method is referred to as “enteric-coating.” This method coats the specially prepared garlic in such a manner so that the tablet does not break down until after it has passed through the stomach. If a non-enteric coated garlic preparation is used, the stomach acid will destroy the majority of the formed allicin. So, these preparations are not likely to produce as good of results as a high quality, enteric-coated product. The same can be said for aged garlic and garlic oil products as these forms of garlic contain absolutely no allicin or allicin degradation products. Examination of the package labels shows several changes in tablet excipients between the pre- and post 1993 tablets. Again, these excipients are believed to block allinase activity. Can garlic really lower blood pressure and cholesterol levels? Since aged garlic does not contain allicin, it does not produce any significant benefits on either blood pressure or cholesterol levels.12 It may provide some other benefits on the cardiovascular system, but the significance of these effects has not been fully evaluated. Based upon Dr. Lawson’s new research, as well as the research conducted by Natural Factors, I am now endorsing Garlic Factors. I feel that it gives a person the best chance of getting all the benefits of fresh garlic minus the odor. Based on the results of the positive clinical trials, the dosage of a commercial garlic product should provide a daily dose of at least 10 mg alliin or a total allicin potential of 4,000 mcg. This dosage equates to roughly one to four cloves of fresh garlic. 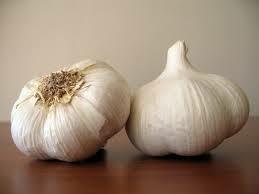 Each tablet of Garlic Factors provides 6,150 mcg of allicin, very high potency. But, the real advantage of Garlic Factors is the fact that it is manufactured by Natural Factors — the experts in effective natural products. As a result, you are assured that Garlic Factors has been designed to produce results consistently. Garlic preparations taken orally, even “odorless” products, can produce a garlic odor on the breath and through the skin. Gastrointestinal irritation and nausea are the most frequent side effects. Beware of the propaganda on the dangers of allicin. I do not argue that acute and prolonged feeding of large amounts of raw garlic to rats results in anemia, weight loss and failure to grow, and even death.13,14 However, the dosages of fresh garlic used in these studies to produce these toxic effects were incredibly high, e.g., 500 mg of fresh garlic per 100 g of body weight. What about antimicrobial and immune enhancing effects? immune system and human population studies have shown that eating garlic regularly reduces the risk of many cancers.18 This is partly due to garlic’s ability to reduce the formation of carcinogenic compounds as well as its positive effects on the immune system. Does garlic interact with any drugs? Theoretically, garlic preparations may potentiate the effects of the blood thinning drug Coumadin® (warfarin) as well as enhance the antiplatelet effects of drugs like aspirin and Ticlid® (ticlopidine). If you are taking these drugs, please consult a physician before taking a garlic product. Garlic may increase the effectiveness of drugs that lower blood sugar levels in the treatment of non-insulin dependent diabetes (Type 2 diabetes) such as glyburide (Diabeta, Micronase). Consult a physician to discuss proper monitoring of blood sugar levels before taking a garlic product.